The Wild Horse Observers Association filed suit in 12th District Court Monday to force the New Mexico Livestock Board to treat a herd of unclaimed horses impounded last week near Alto as “wild horses” under state law. Now that the Livestock Board seems to be moving toward returning the horses to Lincoln County next week, that request may be the lawsuit’s key remaining goal. Since the New Mexico Court of Appeals declared in the Placitas case that they are not livestock either, Reynolds said such horses on private land have no more protection under the law than skunks, raccoons or other intruders. Land owners can dispatch them on the spot if they want. The Alto herd was captured by a private landowner and turned over to the Livestock Board. “I don’t think the state can change its obligation by picking them up on one location rather than another,” Sanders said in a phone interview. A wild horse that is captured on public land shall have its conformation, history and (DNA) tested to determine if it is a Spanish colonial horse. If it is a Spanish colonial horse, the wild horse shall be relocated to a state or private wild horse preserve created and maintained for the purpose of protecting Spanish colonial horses. If it is not a Spanish colonial horse, it shall be returned to the public land, relocated to a public or private wild horse preserve or put up for adoption by the agency on whose land the wild horse was captured. (3) euthanized; provided that this option applies only to wild horses that are determined by a veterinarian to be crippled or otherwise unhealthy. It remained to be seen how important the “captured on public land” language might be. 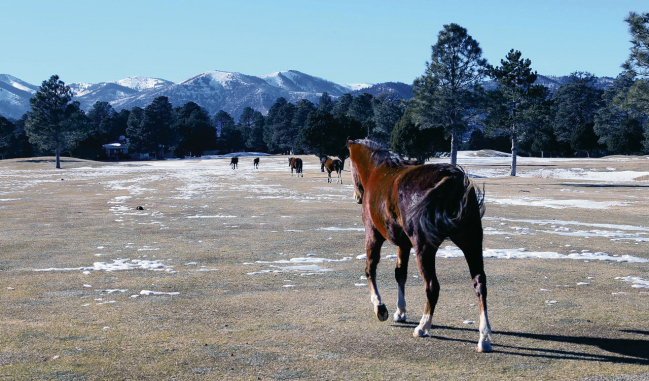 The Court of Appeals ruling in the Placitas case expressly presumed the horses were captured on public land, although Reynolds said that was incorrect. In any event, neither the law nor the binding court opinion expressly addresses the status of an unclaimed horse that may roam on public land but was captured on private property. The WHOA suit filed Monday may turn out to be an opportunity for a court to clarify that point. The suit asserts that “the wild horses have become a staple of life for the people in Lincoln County, and a vast majority of residents support and prefer the presence of these wild horses living on the public lands as well as roaming private lands in their community.” That point too may draw some argument as it did from Reynolds’s clients in the Placitas case.